At events, I often get asked what are my favourite horror book and movie. I pretend to umm and ahh whilst knowing exactly which film had the greatest impact on me, and which book turned me onto horror from the usual feast of sci-fi and fantasy that I’d devoured as a youngster up until that point. Alien (Directed by Ridley Scott) is my favourite horror film. It’s stood up to the test of time incredibly well (it was made released in 1979). But in this instance, it’s a case of an oldie being a goody. In a time when there was no CGI to create the on-screen monster with, the supernatural and horror creatures in horror movies of this time were all too often, well… a bit naff. Far too many films with a great premise were ruined by shockingly bad make-up and costumes. If the guy in the latex suit looks like a guy in a latex suit, something is wrong. Alien was different. For starters, the monster was unique – no reconstituted horror tropes here, oh no. Not only unique, but you get THREE monsters for the price of one. Facehugger is the first incarnation of the Alien: the thing that adheres to John Hurt’s face and implants something into his stomach. When the Facehugger drops off, all seems well, but there’s much worse to come. The next embodiment of our monster is the most shocking, and provides the film with its most memorable moment, as Chestburster erupts from the still-living body of the unfortunate space traveller and whizzes off across the room, the audience squirms in its seats. The last incarnation of the monster is also brilliantly imagined, and the fact that it is only seen in glimpses (terrifying glimpses, yes) lends to the tension and fear that the film evokes in me even now (and I’ve seen it countless times). I love the originality of Alien, and it still outranks almost every other horror movie for me. My favourite horror book may not be the best book associated with the genre, but it is the one I think had the most impact on me at a young age. I read it at the age of about twelve or thirteen, and it was the first ‘proper’ horror book I ever picked up. Carrie by Stephen King is about as far away from Alien as you could get. 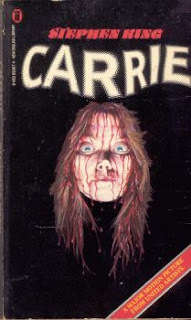 Set in an American high school, the book is written in an epistolary style, using diary entries, newspaper articles and interviews to explain how whole parts of the town and many of its inhabitants are eventually destroyed by the shy and bullied Carrie White, who uses her newly discovered telekinetic powers to wreak havoc on those who have made her life so miserable. I picked this book from my sister’s bedside cabinet, drawn to it by the gruesome cover of a girl with blood running down her face. I stole it and read it in secret in my room, and it scared the wits out of me. I have never been as scared as when I read that book in my room over the next two nights, and I realised that I quite liked the sensation. I was hooked and I’ve loved horror (good horror, at least) ever since. I recently re-read Carrie to see if it too had stood the test of time. It passed with flying colours, and is a great example of why he’s considered to be one of the standout writers of the 20th century. So that’s it. My fave horror movie and book, and the reasons I love them so much. If you haven’t checked them out, do so. Horror! Well, yes. I still can't watch the whole of Alien and tend to agree with you. Mind you, I am not a good critic. When faced with the tension of horror movies I really resent having my time being strung along by the director. I know that x is going to appear/happen soon so my strongest thought is "Just get on with it!" Ridley running along and along the dark metal corridors gives me stress not pleasure. Partly it's because I am always watching how the plot will turn out, and therefore don't welcome the uncomfortable stress of having someone else's timing imposed on my ticking of the plot points as they appear. At least with a book - esp a Stephen King book - you can just read faster or skim read. Maybe I'm just a control freak, eh? or maybe too much hoor already to be really worried about? But good to have such scary moments recalled on genteel (? )ABBA!